Yes, the first flat screen TV was actually introduced in 1958, but that’s not the only strange invention you’ll find in this blast from the past. 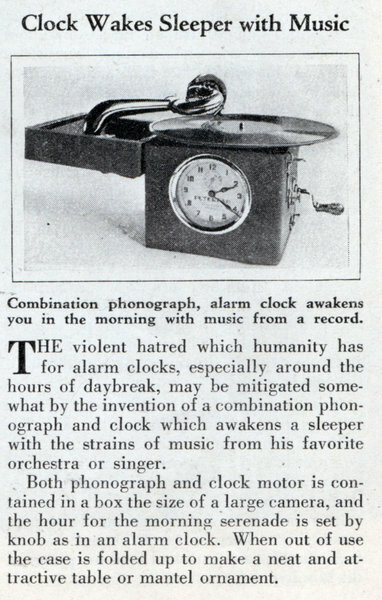 Similar to the CD player alarm clocks we have now, this device offers a built-in phonograph that “awakens you in the morning to the sound of music”. The “Clock Phonograph” was first shown in a 1931 issue of Modern Mechanics. Both phonograph and clock motor is contained in a box the size of a large camera, and the hour for the morning serenade is set by knob as in an alarm clock. When out of use the case is folded up to make a neat and attractive table or mantel ornament. First introduced in 1947, this wrist-watch radio used a “new miniature radio transceiver being developed by the U. S. Bureau of Standards”, capable of receiving/transmitting short waves while also picking up standard radio broadcasts. This 14 ton camera from 1934 cost a whopping $15,240 ($217,540.28 – 2005) to construct — weighing in at 14 tons and 31 feet long. Two years’ time was needed to build the camera which can take photographs with microscopic exactness. It is equipped to make nautical and airway charts with a precision of less than l/1000th of an inch. The camera can hold plates as large as 50 inches square. According to this old Popular Mechanics article, flat screen televisions have been around since 1958 — or at least the technology. Designed mainly for military use, it just never caught on due to patents/licensing issues.